Bert van de Roemer explores the curiosity cabinet of the Dutch collector Levinus Vincent and how the aesthetic drive behind his meticulous ordering of the contents was in essence religious, an attempt to emphasise the wonder of God’s creations by restoring the natural world to its prelapsarian harmony. Detail from a print featured in the first part of Vincent’s Wondertooneel der Nature – Source. 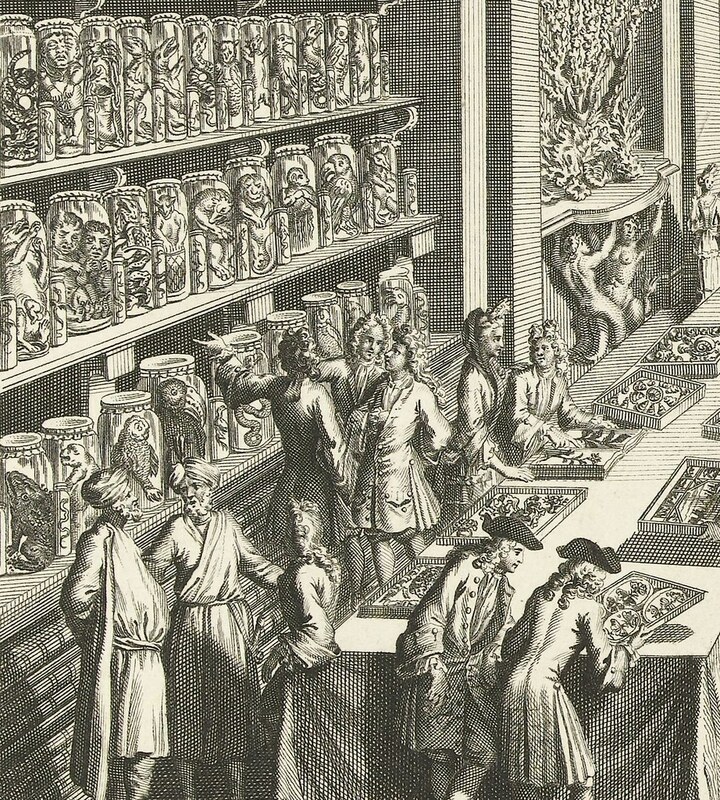 The cabinet of curiosities of the collector Levinus Vincent (1658-1727) was known as one of the finest and most remarkable in the Dutch Republic during the late seventeenth and early eighteenth centuries. A visitor once stated that, in the same way that nobody would believe you could visit Rome without seeing the pope, so nobody would believe you‘d visited Amsterdam without seeing Vincent’s collection. Vincent himself called his collection a “Wonder Theatre of Nature” (Wondertooneel der Nature). The collection comprised of eight cabinets containing, among other things: 600 phials of animal cadavers in spirits, 288 boxes of indigenous and exotic insects, 32 drawers of shells and crustaceans, 14 drawers of minerals and fossils, and a cabinet with a woodland-like scene created from different kinds of corals and sponges. Though the sheer volume and variety of exotic and marvellous objects on display played a key part in the fame of Vincent’s collection, it was also the unique manner in which these objects were presented which made the collection so special. Indeed, a German visitor, the scholar and bibliophile Zacharias Conrad von Uffenbach, wondered what was cause for more astonishment, the objects themselves or the novel manner of their presentation. Through various prints Vincent had made of his cabinets we can see just what so impressed its visitors and the enormous effort that Vincent and his wife Joanna van Breda must have taken in arranging their precious collectables. Earlier collections of the sixteenth and seventeenth centuries usually displayed a heterogeneous assemblage based on the accumulation of individual objects, all juxtaposed in such a way as to emphasise variety, abundance and contrast. In the late seventeenth and early eighteenth centuries, however, a new tendency of ordering began to gain favour. Collectors were focused more on the overall composition of their collection as a totality, paying particular attention to the proportional and aesthetic harmony between the individual objects. More and more the abundance of nature became subject to a mathematical and symmetrical ordering. The cabinets of Vincent, so painstakingly arranged by himself and his wife Joanna van Breda, were at the forefront of this movement and the example par excellence of such a style. The frontispiece to Vincent’s Wondertooneel der Nature – Source. The great importance that such an aesthetic ordering played in Vincent’s cabinet is shown in the frontispiece he had designed for his small catalogue, Wondertooneel der Nature, published in 1706. 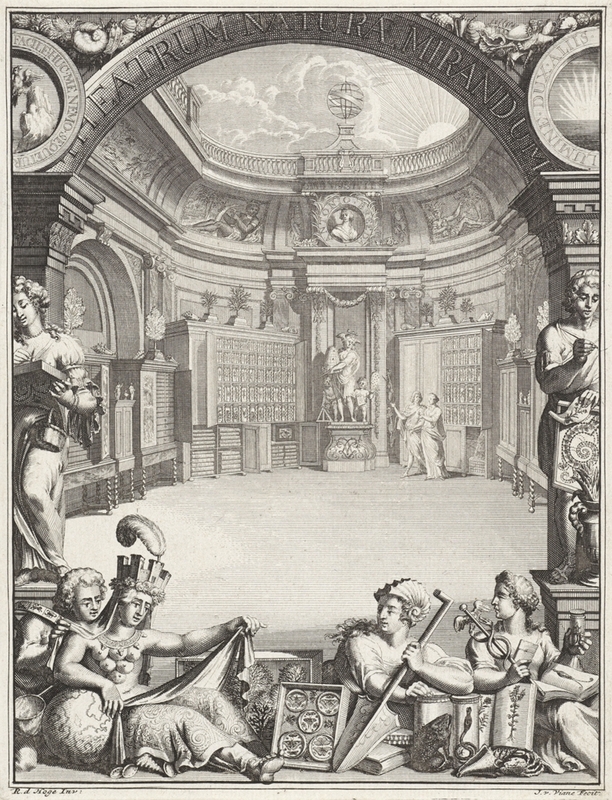 In the background of the image there stretches out a hall with eight symmetrically placed cabinets. The foreground reveals allegorical figures that tell the viewer about various aspects of collecting. The figure on the far left represents the Explorer. He holds a net to collect insects, fishes and other small animals, and the zodiac around his shoulders shows that his inquisitive mind should have no limits. 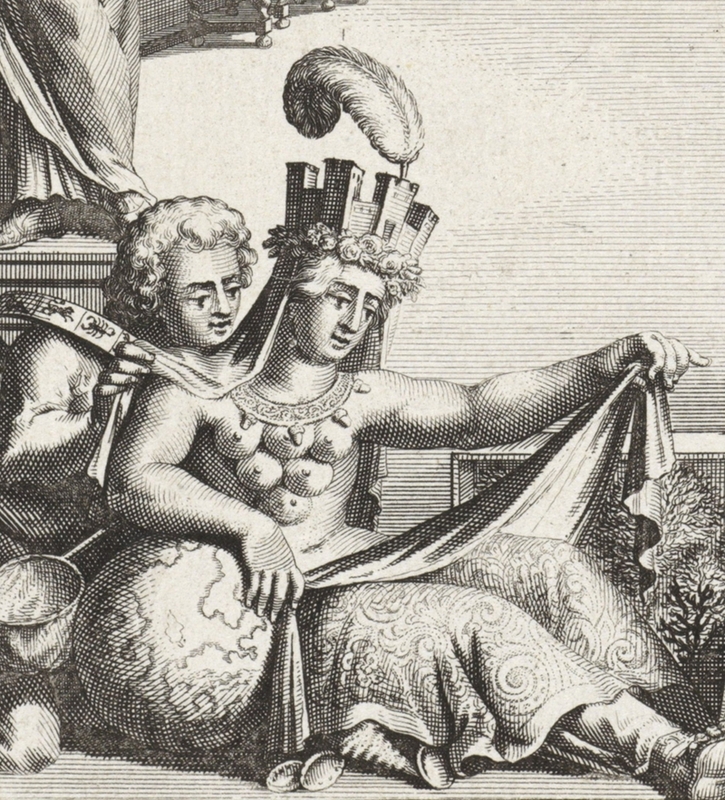 He is shown peering under the exquisitely embroidered garment of the figure next to him, who represents Nature, here depicted as the many breasted goddess Isis with a city wall crown on her head and a globe under her arm. The Explorer, ever curious, is investigating what Nature has to offer. To the right of Nature sits the personification of Seafaring with oar in hand and a shell on her head under which flows her hair as waves of the sea. She represents the possibility given to Dutch collectors to be able to collect such exquisite exotica from the East and the West. At the far right of the picture is a reclining figure holding a letter, a caduceus and a jar containing a lizard. Behind her ear sits a writing pen. She represents the Enthusiast or the Collector, describing and noting down everything she observes and communicating this with her fellow collectors and enthusiasts. Detail from the frontispiece to Vincent’s Wondertooneel der Nature, showing the Explorer having a sneaky peek at what Nature has to offer – Source. With respect to this new method of harmonious and aesthetic ordering, the sculpted group in the background at the very back of the hall between the cabinets is particularly significant. The woman in the middle is described as a ‘swift nymph’ who is responsible for the good order of the collection; the beehive in her hands expresses that her busy efforts can be compared with the indefatigable work of the bees, constantly storing honey in the ‘remarkable structure’ of wax cells. The nymph is assisted by two putti, named ‘Pattern’ and ‘Adornment’. The former holds a compass and a set square and takes care of the harmonious layout of the ground-plans, the latter holds a peacock’s tail and a drawing and sees to it that the vertical elevations of the cupboards make for a splendorous and magnificent sight. 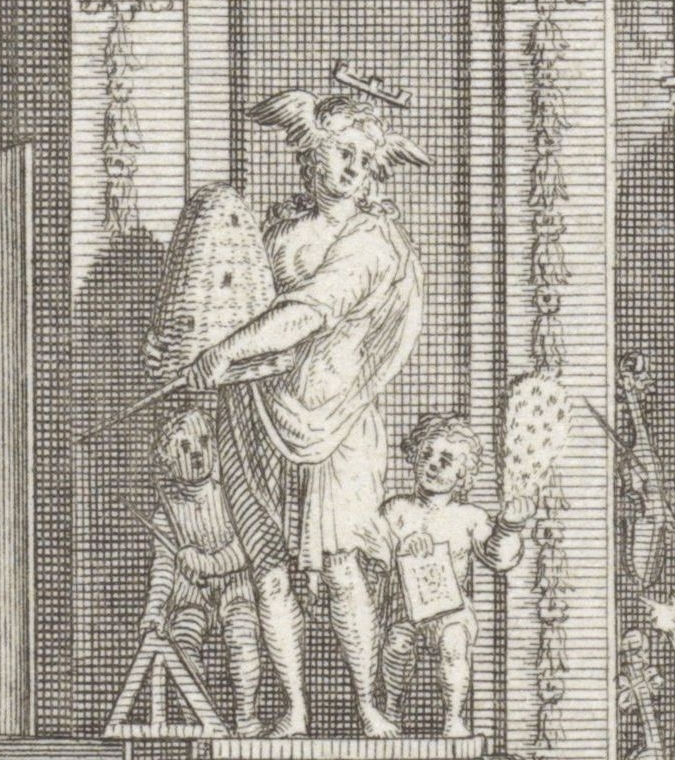 Detail from the frontispiece to Vincent’s Wondertooneel der Nature, showing the sculpted group at the very back of the hall, the nymph assisted by her two putti, Pattern and Adornment – Source. 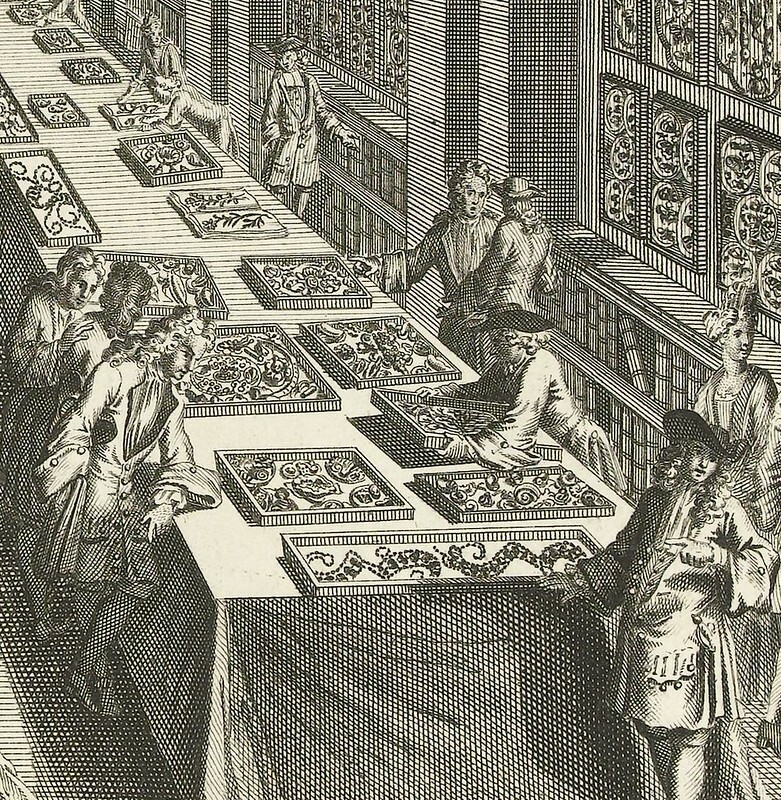 The end results of this expert ordering become apparent in the seven prints of the separate cabinets shown in the second part of the catalogue. A closer look at these will show how Vincent and Joanna varied in different modes of display, but were both consistent in their desire for harmonic proportion. For instance, Vincent possessed two large cupboards of which the upper halves comprised five shelves filled with phials containing animals suspended in spirits, including remoras, swordfish, snakes, toucans, sloths, opossums, chameleons, crocodiles and even some human embryos. The space between the shelves diminished gradually on each higher level and Vincent gives, like all of his other drawers and cupboards, the exact measurements in his catalogue. 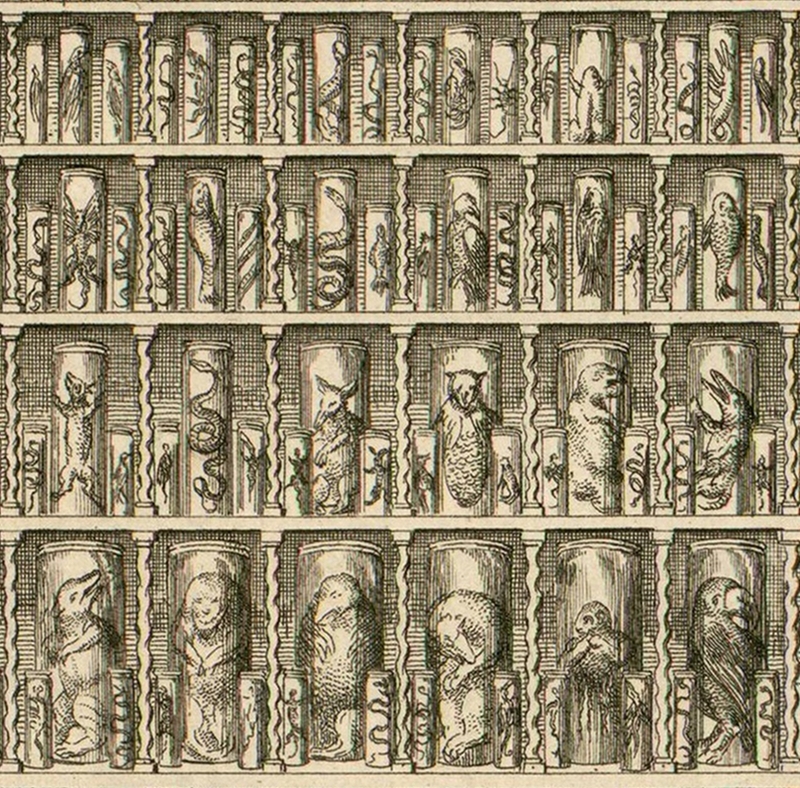 Each shelf was divided into thirteen compartments by delicately turned pillars and each compartment contained one large phial flanked by two smaller ones. When looking at these prints, comparison with the bees in their beehive seems certainly apt. The cupboards presented an elegant harmonic spectacle in which proportional and geometric order ruled. Print featured in Vincent’s Wondertooneel der Nature – Source. Another, more stylized mode of display, can be seen in the cabinet containing insects, eggs and dried animals. 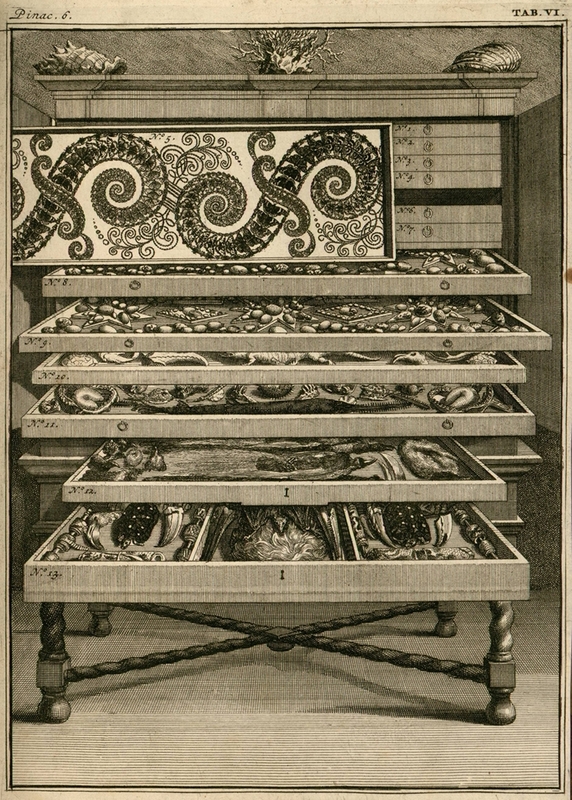 In this print, one of the drawers with insects is turned on its side to show its contents to the beholder. The butterflies, beetles and flies are arranged in decorative patterns of symmetrical curls and loops. The countless individual specimens form the tesserae by which the grander form is built. In his description Vincent stresses that every insect was placed according to their colour, size and design in relation to the adjacent specimen, but also with consideration of the total design that, according to Vincent, resembled pieces of embroidery: ‘a work that is impossible to represent in words or images’. Looking at the print we can only wonder what the effect would have been like in real life with all the shining and brilliant colours of the insects still present. Vincent told a German visitor, who compared the drawers with delightful tapestries, that tsar Peter the Great took to his knees before this cabinet to take a closer look, a posture that was later interpreted to be an act of praise. The pride of the collection was a cabinet containing 68 drawers with 288 boxes of insects and some small birds. Vincent stresses that the collectables here were submitted to an ‘extraordinary regular order’. 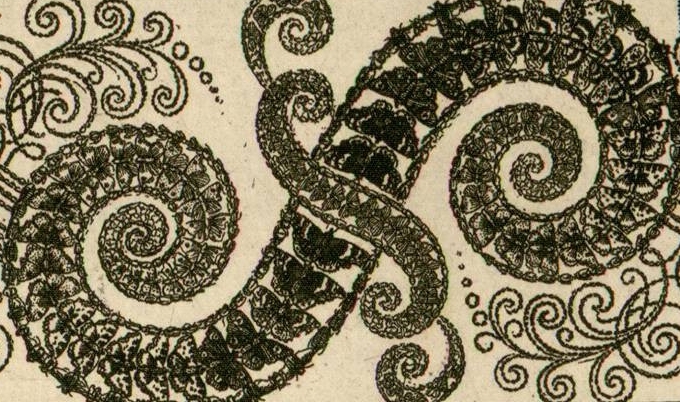 As science historian Emma Spary has pointed out in her article “Scientific Symmetries”, the print shows a deliberate juxtaposition of the boundless variety of nature with the strict ordering practices of the collector. She discerns three tiers. 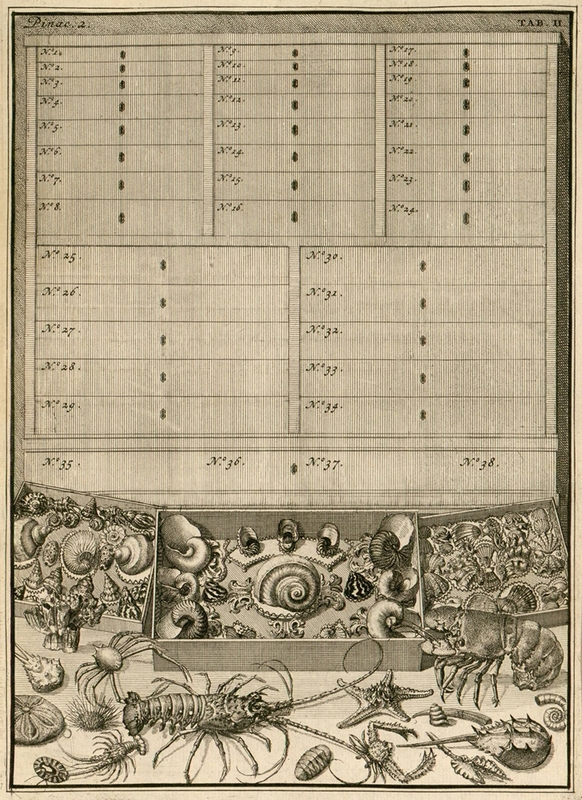 In the upper part we see three columns of drawers, showing the ‘order imposed by the human possessor’ and expressing the ‘classificatory principles used by the naturalist’. The upright drawers in the lower half presenting their contents show how the ‘strong contrasts in form and pattern’ of the insects were subjected to a ‘bilateral symmetry in ordering’. On the ground, the third tier, we see specimens ‘placed completely at random, even, apparently, escaping the frame of the picture’. They show the boundless and disordered state in which nature presents herself, and which man could bring into better, more organized states through his intellectual and artistic capacities. From a modern point of view the activities of Vincent and Joanna might seem a frivolous way of passing time, but we only have to think about the enormous amount of effort they must have put into their compositions to understand the many words of praise from their guests. For example, creating the drawer with butterflies must have been a particularly laborious and toilsome task. First, as insects constrict their legs and wings as they die, each specimen would have to have been brought back to its natural posture. This was done by soaking them and then placing each leg and wing, without breaking them, to their original state. Next, a rough sketch of the total design would have been made, which was then elaborated on special gridded paper. This would then have been transferred to the bottom of the velvet-lined drawer. Then, with tiny needles each insect, one by one, would have been pinned in the drawer, slowly building up the total form. The utmost care was taken so that each specimen fitted according to their proportion, colour and design in relation to its neighbour. Thus a gigantic work of natural mosaic was created. But even then the work would have still not been finished: three to four times a year all the boxes and drawers with insects would have to have been rubbed with lavender oil for preservation. In the panegyrics on the collection the designs of Vincent and Joanna are often compared with the most delicate pieces of embroidery, tapestry or damask. This was no coincidence, as it relates to Vincent’s trade. In the literature he is often described as a ‘damask merchant’ or simply a ‘merchant’ but this does not fully do him justice. He was indeed a merchant of luxurious tissues such as silks and damask, but first and foremost he presented himself as a ‘designer of patterns’. The silk production was a complex and specialized industry that involved many different crafts, from creating the first thread to selling the final cloth. Pattern designers often had an artistic background and from Vincent himself – whose education remains a mystery – it is known that he was a member of the guild of St. Luke, the guild for painters. The artistic skills he used in his trade were applied to add lustre to his collection. In his catalogues, time and time again, Vincent emphasizes that the arrangements were according to his own ‘ordinance and design’. It seems to have been of great importance. He also repeatedly expresses the great pains and costs it took to maintain his cabinet. But it was certainly not an idle pastime. He declares that many visitors, whilst looking at his collection, were strengthened in their religious faith. Vincent presented this as his ultimate goal. He noted the beneficial effects of his cabinet: the righteous saw themselves affirmed in their beliefs, while the ungodly found reason to acknowledge the Almighty. The faith of visitors was not only affirmed by the magnificent objects they beheld, but also by the special manner of its presentation. Levinus and Joanna were creating a spectacle that presented nature in a harmonious and balanced state, a state which it had once known in Paradise. After the Fall and the Deluge, nature was considered to have departed from this original harmony and fallen into disarray. This was now rectified by Levinus’ and Joanna’s intricate and laborious work. One visitor wrote: ‘Where once in paradise was Adam with his Eva, thou are there with your spouse to arrange God’s wonders.’ Another poem expressed how Joanna and Levinus ‘re-created’ nature in their cabinet. By presenting their collectables in such designs they were not only presenting a pleasurable sight, but also restoring nature to the beauty of its prelapsarian state. In this way, in Vincent’s room of cabinets, knowledge of nature, aesthetic appreciation and religious contemplation all intermingled and enhanced each other. His collection functioned, indeed, as a wonder theatre of nature. G.M. van de Roemer, ‘From vanitas to veneration. 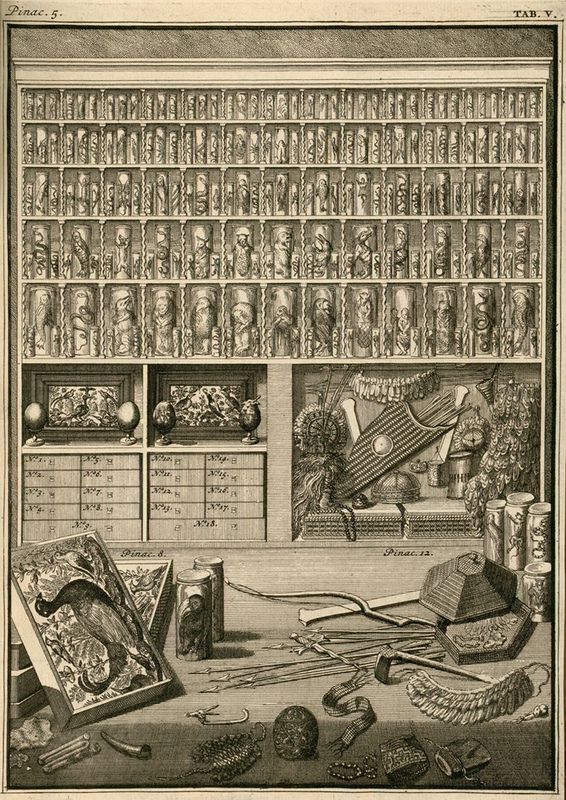 The embellishments in the anatomical cabinet of Frederik Ruysch’ in: Journal of the History of Collections 22 (2010), nr. 2, p. 169-186. G.M. van de Roemer, ‘Neat Nature. The relation between art and nature in a Dutch cabinet of curiosities from the early eighteenth century’ in: History of Science 42 (2004), p. 47-84. E. Spary,’Scientific Symmetries’ in: History of Science 42 (2004), p. 1–46. A challenge to the usually held view about the Golden Age’s scientific culture in the Netherlands. The book shows how nature was, next to the Bible, thought of as a second book of God, and how the advances in biblical criticism led to a new view of nature. A study of the Dutch textile industry between 1585-1750, of the fabrics made and the lives of those who made them.